YEARS BEFORE the famous Blind Boys of Alabama gospel group formed in 1939, or the awesome Five Blind Boys of Mississippi formed in 1936 – not to mention the impossibly obscure Five Blind Boys of Montana, whose disc ("Brother Bill") I've struggled for 20 years to date – the Blind Radio Five Orchestra was working out of Seattle. 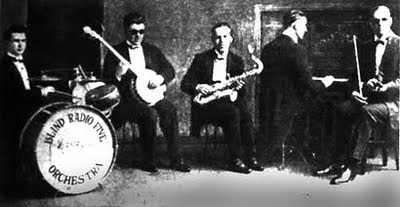 They were a quintet comprised of (left-to-right): William A. Teater (drums & manager), Claude E. Judge (banjo), Paul Tischner (sax & clarinet), Virgil Robison (piano & director), & Daniel O. Black (violin). As the Seattle Times noted in 1925: "These talented young blind musicians have appeared frequently over KFOA and have won a host of friends through their artistry. The organization is declared to be the only professional blind orchestra o the Pacific Coast. When it is remembered that the musicians must necessarily play by memory their efforts are truly remarkable." KFOA – the first Seattle station to join a national network (NBC) -- was based on the second story of the Rhodes Department Store on Second Avenue. Its studio was built so that shoppers could stop by and watch while programs were being broadcast live. On the evening of February 7, 1925, the Blind Radio Five performed for a Seattle Times-sponsored KFOA program from 8:30 p.m. until 10 p.m.. The band opened their show with a version of "You Go Your Way and I'll Go Mine" a newly popular tune which had been released by Victor Records on September 5, 1924 as recorded by Glen Oswald's Serenaders who'd originated in Portland Oregon. Then came "Follow the Swallow," "Honest and Truly," & "Where Shadows Fall." Next, Black performed a violin solo on "Then Will You Remember Me?," the Five played "Mama's Gone, Good-Bye," & Tischner did a solo sax rendition of "Marguerita." That was followed by "Blue," & the overture to "Abecia," Judge's banjo solo on Chopin's "Prelude" & "Bar Study," & Robison's piano solo on "The Octave Study." The fivesome then wrapped up their show with "Eliza" & "China Girl."